Bizco is a professional WordPress theme designed by Themify for business and portfolio sites. This theme showcases a broad array of unique features for exposure of product and services. With the integration of customizable page template, users can highlight posts and web pages easily with the help of illustrative custom panel. 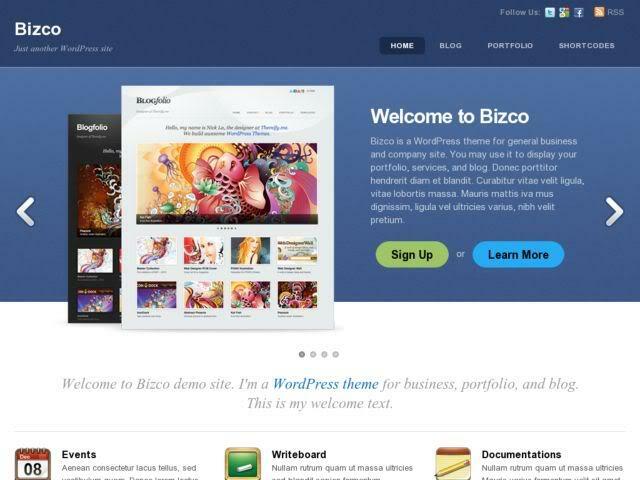 Bizco is a multi-faceted and feature-rich WordPress theme created by Themify. Bizco Theme utilizes latest features WordPress 3.0 that includes “Child Theme Support” and “Custom Post Types”. Incorporation of these features in the theme makes your site more accessible and manageable. Bizco theme comes with multi-page templates featured with additional custom templates as well as archives to augment the appearance and the worth of a site. By having this plugin as a feature in Bizco theme, users can choose from a wide range of innovative pages for their portfolio or blogging site. To make user’s life much easier, theme developers have included latest “Custom Post Types” of WordPress 3.0 in Bizco Theme. Now, Bizco theme can handle homepage sliders, highlights and custom menus. Footer slider is popular as a pop-up footer used by visitors to see an advertisement for brand exposure. Visitors also use this plugin for subscribing to email newsletter for inviting people to site and sponsorship of event. Users can easily configure this plugin depending upon the requisite of site owners through simple modifications of xml file available in package. Header sliders are basically added to include add banners on web page or post. Shortcodes simplifies the process of selectivity among site owners willing to create a beautifully designed web page. You can add these Shortcodes each time you add content to site. By using this trait of Bizco theme, you can create everything like column layouts, button styles and dropdown menus. Theme Option Panel provides an easy access to users so that they can make all desirable changes in the theme and include specific facet like Twitter links. To improve the worth of the site and functioning of theme, Options Panel is the most suitable attribute. Themify theme developers want to address the management of sidebar in an efficient manner and this is the reason why they incorporated Sidebar Options in Bizco Theme. Bizco theme gives you an opportunity to set diverse sidebar visibility specifically for individual pages or post. Bizco theme permits you to adjust theme appearance by applying three different color skins. Users willing to change the skin of theme can access “Skin” tab and can easily select theme skin that fits your mood and your theme background. Bizco theme comes with responsive layout that makes it more adaptable to the presentation of webpage and screen resolution of multiple devices. Bizco theme responds to orientation as well as screen size of mobile devices. Recently, Themify theme developers accustomed a server breakdown due to presence of virus in framework. However, this malfunction has been settled now with the launch of latest version of framework but this malfunction decelerates the speed of Bizco Theme. One-Year Subscription for Developer Club: $89.